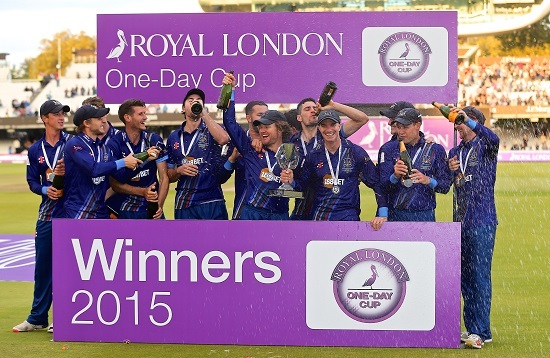 GLOUCESTERSHIRE has been crowned Royal London One-Day Cup champions after a thrilling fightback at Lord’s, the Home of Cricket. Eleven years after the club’s last major trophy success, the young squad came of age to beat Surrey by six runs in the final over of the match. With seven runs needed off the last six balls and two wickets left, David Payne held his nerve to dismiss Sam Curran and Gareth Batty to spark wild celebrations. Fittingly it was man-of-the-match Jack Taylor on the mid-wicket boundary who took the winning catch to write a new chapter in the club’s proud one-day history. The 23-year-old all-rounder also played a pivotal role with bat and ball, taking 3-43 and smashing 35 off 26 balls to inspire his side to a famous victory. Having been bowled out for 220 the game looked to be slipping away when Surrey’s Kumar Sangakarra and Rory Burns added 101 for the third wicket. First Sangakarra (60) was caught by sub fielder Will Tavare at mid-on attempting an uncharacteristic lofted shot down the ground to make it 143-3 in the 35th over. Taylor then struck again in his next over as Burns (56) was stumped needlessly trying to increase the scoring rate. Smith (2-42) dismissed Mahmood (5), and Tom Curran (0) became Taylor’s third wicket and a Chris Dent run out did for James Burke (11) to help set up the crucial final over. Earlier Glos had been bowled out for 220 with Jade Dernbach taking a hat-trick as he recorded career-best figures of 6-35. Speaking before his final match Geraint Jones, told Glos to “dare to dream” but they got off to a nightmare start as they lost Michael Klinger to the third ball of the day. The skipper was caught behind by Wilson after flashing at a short wide delivery from Dernbach. Such as been Klinger’s dominance in the competition – scoring 531 runs at an average of 132.75 before the final – that you could forgive the travelling Glos fans for fearing the worst. Veteran Pakistani allrounder Mahmood (2-28) was proving a handful and bowled both Benny Howell (9) and Roderick (39) with balls that nipped back in off the seam down the famous Lord’s slope to make it 108-4 in the 25th. In his last ever match Geraint Jones had been greeted with a warm reception from both sets of supporters. And together with Tom Smith he set about watchfully rebuilding the innings. Jones brought up his 50 in the 48th over with a boundary off Dernbach through third man and celebrated by waving his bat to his family in the crowd.